Midland Hotel01274 735735work01274 720003fax HotelThe Midland Hotel the ideal City Centre location for visiting The National Media Museum, or catching one of the fantastic shows at the Alhambra Theatre or St Georges Hall. We are also a short drive or steam train journey away from the world famous Bronte Country. We are next to Forster Square Train Station –Which is a 15 minute journey to Leeds or World Heritage site Saltaire. The Midland Hotel, Bradford, AA Merit score of 77%, has 90 Executive, Premium and Standard bedrooms with En Suite facilities, A limited number of rooms have the full Sky TV package, Ironing and Trouser Press in each room. The hotel boasts Executive, Premium and Standard accommodation with Four Poster Rooms, and Interconnecting Family Suites. An Automatic Upgrade to a Lady Executive Package is available for the Lady Business Traveller. Other facilities at The Midland Hotel, Bradford include FREE Wireless Broadband with no time restrictions, an offsite complimentary Gym and Free Car Parking for residents on site. 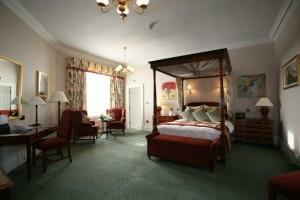 All midweek guests will also receive a complimentary glass of wine on arrival. AA 3 STAR Hotel DELICIOUSLYORKSHIRE MEMBER COMPLIMENTARY CAR PARKING ONSITE AND UNLIMITED FREE WIFI THROUGHOUT THE HOTEL. The Midland Hotel the ideal City Centre location for visiting The National Media Museum, or catching one of the fantastic shows at the Alhambra Theatre or St Georges Hall. We are also a short drive or steam train journey away from the world famous Bronte Country. We are next to Forster Square Train Station –Which is a 15 minute journey to Leeds or World Heritage site Saltaire. Take the M62, M606, A6177 and then the A650. Maintain A650 and bear right. Go straight through 2 sets of lights. Turn left at the following lights signed city centre south. Turn right at the roundabout and left at the next roundabout, hotel is on your right hand side. From Bradford Forster Square station exit onto Manor Row, turn left and hotel is 50 yards on the left hand side.